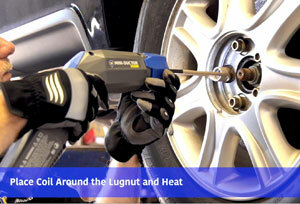 Removing Lug & Wheel Nuts with the Mini-Ductor® Venom Induction Heater & Flameless Torch. Removing seized lug and wheel nuts is often a lengthy, difficult and frustrating task for auto mechanics especially if using an acetylene torch. 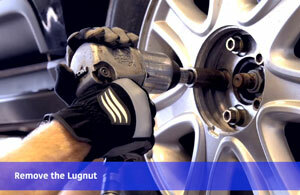 Lug nuts rust easily and it can be very difficult to remove them. The Mini-Ductor handheld induction heating tool, uses Invisible Heat® to heat ferrous metal (containing iron), and some non-ferrous metal, parts in seconds. This allows all types of adhesives bonded to metal, bonded with thread lock compound and seized hardware to be removed and released much quicker and more safely than by traditional naked flame heating. And there’s no costly and time consuming damage to surrounding areas. 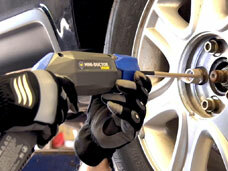 Garages, technicians and tire shops do not need to run the risk of using a torch. 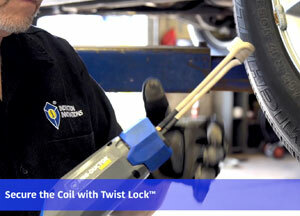 The Mini-Ductor’s coil heats a lug/wheel nut in 15 seconds, which would take several minutes with a torch. The heat expands the nut, breaking any corrosive bonds without collateral damage to the wheel.